Dan Jones of Wales and Karl Dickson of England will referee the championship semifinals at World Rugby's Under-20 World Championship. Jones will referee the match between South Africa and England and Dickson the semi between New Zealand and France. 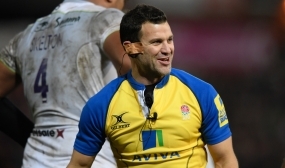 Of the referees, Egon Seconds and Damon Murphy represented their national teams at Sevens, Karl Dickson was a scrumhalf for Harlequins and toured South Africa with England, Seconds and Jamie Nutbrown played Super Rugby. Pali Deluca, the son of the international referee Pablo Deluca, played for years and is probably the only amateur referee at the championship. You may have noticed the Hourquet name among the assistant referees. Flavien Hourquet is the son of René Hourquet, an international referee of note. The eight teams not in the semifinals play for positions in semifinals of their own - for fifth to eighth place and then from ninth to 12th place. The matches take place on Tuesday, 12 June 2018 with kick-offs at 16.00, 19.00 and 21.00 in Perpignan and Narbonne.